I’m with you all the way on this one. BT have really disappointed us – and it seems so hard to find the decisionmakers to try and understand their thought processes…. Let’s try to get some momentum on this! Hmm I did wonder if the application for a new DSLAM box where I live was BT trying to fight back against the fibre of Virgin – seems now perhaps it wasn’t. I do think this needs to be mentioned to the Gazette as they presented the news as BT and Basingstoke being at the forefront of new innovation for all. Good work, I have seen some other ost showing that certain part of beggarwood will be enabled, I’m on the basingstoke exchange and not the dummer one so here’s hoping. If you look at AAISP’s website (http://www.aaisp.net.uk) and put your number into their line checker, it should tell you. I also saw a number of OpenReach vans installing Cables in Old Basing this morning. Brilliant thanks, put it in and it is not showing up at present however I have seen the cabinet in Beggarwood that I’m connected too. It’s cabinet number 84 near Breadelsfield and I have read elsewhere that this is due for DSLAM access. I have built out an impartial micro site to educate consumers and business in Basingstoke and Chineham as to what is finally coming. It is at http://www.objectbase.co.uk/basingstoke/chineham/fttc/ and I have linked back to you as your site was very helpful. You will see that Chris (whoever Chris is!) has setup a map of the new DSLAM’s and it was a pleasure to add the only one I could find in Chineham to it (I had a drive around this afternoon and none of the others I could see had any new DSLAMs or obvious signs of work underway). It looks like my service comes of the same BT Distribution Point as Chineham Councillor Martin Biermann, so maybe that helped it get enabled early. The website to check if you can get faster broadband is at address http://www.ehampshire.org/basingstoke/c-304. I live in Beggarwood and I am not supported. I have a brother who lives in another part of Basingstoke and he already gets 50Mbps Virgin Media cable broadband, and yes he is in the new faster BT broadband. Well done BT nice to see you are leeting some people have 2 choices and others none. I get a yes with the eHampshire one but nothing mentioned with the BT line checker. So I wonder how accurate is the eHampshire checker, surely BT’s would be more accurate. check the Line checker on Andrews & Arnold (http://www.aaisp.net.uk) I don’t know if BT Retail are running FTTC, yet. I have been in contact with Andy already. I am even more frustrated since it appears a new cabinet was installed next to my old one which I assumed was for FTTC but it is still not included in the initial phase! Looking at the new cabinets now, it appears that what was installed is just another old one and not one of the new cabinets. What sense is that! Andy provided me with a full list of postcodes which I have converted into addresses and find that there are 21 roads in Chineham which will get VDSL, but not mine. Cabinet 66 is not included! I met up with Tim last night, and we were talking about this very thing. I sent Tim lots of email corrispondance with Openreach, BT and the council – he said he was going to pass it on to you. Then the plan was to all meet up for a beer and the pub and work out a plan. I still think we can get BT to change their mind on these cabinets. Suprise, suprise Beggarwood isn’t covered. Why or why won’t they upgrade people connected to Dummer, yes it might not have that many connections but I bet the demographic of connections would all be high internet users. Hi all yet again being connected to the dummer exchange is a disadvantage, half of beggarwood is on basingstoke the other half on Dummer, you can see the two cabs when you do a school run, happy to add my support as to why wont they upgrade dummer. just stumbled on your page after trying to sort out my broadband. Beggarwood resident very frustrated that Im on dummer exchange get less than 1 mb. Cannot watch Iplayer / you tube etc. Went on the basingstoke and deane website to check if we were being upgraded and very disappointed we were not. YOu have another supporter!!! In the meantime anyone got any sugestions for a half decent ISP with Virgin net at the mo and currently speed is half a megabyte. They told me we could only ever get 1 mb from dummer excahnge even if we did change just wondered if there was anyone slightly better out there. 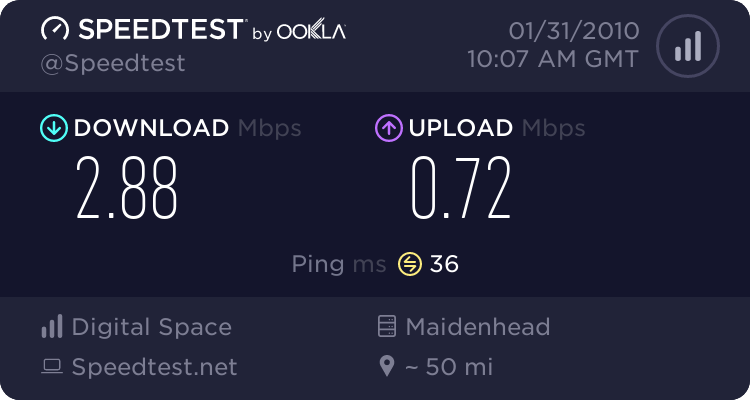 It’s not just people on the Dummer exchange that are being screwed by BT, I’m in breadelsfield and connected to the Basingstoke exchange. No VDSL for me either, because we have no options for broadband apart from through the phone line BT have not bothered, only areas that can get Virgin Media are getting it. I’m moving my line rental to Sky , although Sky still need to pay BT a small sum it means I don’t pay BT any money directly, when they phone up asking about my continued business with them, I will tell them that I was obviously not important enough to them for the FTTC rollout so I’m not going to be giving them any business. You have got my vote, I am sick of trying to get an update from BT as to when I will get my moneys worth as I am paying for option 3 with BT. Is there anything I should be doing to try and help speed things up. I see BT are now offering fibre optic broadband, available from 25th January, branded as ‘Infinity’. However cost looks high (19.99 capped, 24.99 uncapped) for 18 month contract and there’s no bundle available for line rental and calls – so compared with my existing provider I’ll have to find £25/month. (there’s also a checker on the page and it confirms I’ll be able to get it in Kempshott (sorry guys). I don’t think BT Infinity is the answer, I can apparently get it now, however, I already get +2Mb, and this tells me I can get it now, at 1Mb. I would really like to see something that gives areas further out from the exchange the ability to get faster internet, not the same speed as they have now. It says you can get it now at 1MB? are you sure thats not just the ‘BT Total Broadband’ usual crap at the Infinity site? I have the unfortunate problem of being physically close to an upgraded cabinet that has been upgraded (hence told I can get 17mb via post code checker) but being connected to another that has not been upgraded. That list doesn’t seem to be correct, appears to be reversed?. On Friday 22nd the BT Infinity postcode checker was saying I could get Total Broadband at 0.5mbps and Infinity at 17.7mbps – but since it launched on Monday 25th Infinity has disappeared again. I’ve checked a number of other postcodes and they seem the same. Meanwhile, although it had seemed that BTOR had installed the new cabinet (Gracemere Crescent/Kempshott Lane_ they were back again this morning pulling cable through under the ground. I’m a Beggarwood resident and live in Ferndown. Can I suggest you try one of entanet’s resellers for broadband as I have used O2 before and got the same rubbish connection issues and speed problems. I have now returned to my old provider and constantly get 340kbps download speeds even in peak hours. No drops excellent support with people that know what theyre on about and not multi layer support. I’m unsure what cabinet I connect to but if it’s any help my postcode is RG22 4.. I strongly hope you don’t get 340kbps… that is what’s known as BT’s “Fail-Safe” this is what it puts you on, when there are problems on the line. I have no intention of changing my provider, this makes little difference as it all uses the same cable from the Exchange to your house (except Virgin Media). This is more about BT Rolling out FTTC (up to 45Mb access) only where there is Virgin (up to 50Mb) available and NOT where people are stuck with 1Mb connections. they are intentionally NOT upgrading the slow connections and are upgrading connections that already have fast access. If you truly do have 340kbps, I hope you contact your provider and get them to sort your line out, you should be seeing around 1Mb where you are. Apologies for getting my KB’s and kbps mixed up. I see 340KB/s = 2.72Mbps line. This was more response from an earlier poster (Annie Post 16-17) who requested to know what providers in Beggarwood give good service. I wonder if your interleave depth is at the maximum 64 though for your ping to be that high. The eHampshire website says ‘yes’ you will be able to get it, yet every BT line checker I’ve tried including the BT Infinity one has nothing mentioned about it for postcode or phone number. Probably set to auto. Anyways a bit off topic.